This spaghetti recipe comes from my mother-in-law and she has passed it down to her kids- my husband makes it and both of his sisters do as well while I get to just sit back and enjoy! It’s super easy and doubles well for larger groups. 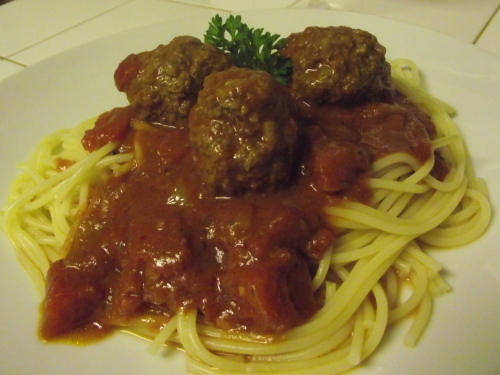 We normally make a double batch and have spaghetti & meatball leftovers for days! As good as it is on night one, it’s even better on day 2 and 3. Trust me when I say that this WILL become a family favorite! These are real meatballs here. No bread crumb filler. In a large bowl, mix together all meatball ingredients and set aside. In a large pot saute onion in olive oil until transparent, add garlic and cook 2 minutes. Add tomatoes, tomato paste and water and simmer for 2 minutes. Add oregano, chili, salt & pepper, mix well and reduce heat to low. Begin forming meatballs- just slightly smaller than a golf ball- and gently drop them in the sauce. When all meatballs are in, reduce to lowest simmer setting and let cook uncovered for 1-2 hours (the longer the better). ****Do not stir during the first 20 minutes as it may break meatballs apart. Even after that- stir as little as possible and very gently. Make your pasta and be prepared to be blown away by this easy but incredibly delicious spaghetti recipe that the whole gang will love!!!!!! This sounds good and I love making meatballs! I think I’m going to try this the next time Mike comes home from work! Thanks doll!